Trade DAX CFDs, other major indices, forex, shares, cryptocurrencies and commodities through Capital.com’s award-winning platform. No commission. FCA and CySEC regulated. Up to 1:200 leverage (professionals only). Available on web and mobile. AI technology. Trade now. Why is the DAX important to traders? The Deutscher Aktienindex, or DAX, tracks the value of the 30 biggest companies listed on the Frankfurt Stock Exchange (FSE) and this is represented in real time by the DAX price. As the listed companies that make up the DAX 30 index represent around 75% of the total market cap of the FSE, the DAX is often viewed as a gauge for the German economy. This is one reason why DAX trading is popular with many of our clients. You can track its price in real time on our platform using our DAX live chart. The German economy is the largest in the European Union and the fifth biggest economy globally. It is an active and liquid market and this is why so many of our clients choose to trade DAX. The main trading hours for the DAX 30 index are between 09:00 and 17:30 CET, though Deutsche Börse also calculates the early DAX (08:00 – 09:00 CET) and late DAX (17:30 – 22:00 CET) for trading out-of-hours. You can trade the German DAX index 24 hours a day with Capital.com and monitor the price changes with our DAX live chart. The DAX price typically provides traders with a high degree of liquidity, long trading hours and tight trading spreads. You can trade the DAX index today using CFDs (contracts for difference) or futures. Using CFDs to trade DAX will allow you to go long or short without having to deal with conventional exchanges, like Eurex. Traders enjoy trading the DAX because trends can often be easy to spot on live charts. Traders who trade DAX 30 often find the trends to be well defined across a variety of timescales, making the DAX popular with CFD traders around the world. How is the DAX calculated? The DAX index is capitalisation-weighted, which means that companies with bigger market caps will have a bigger influence on the DAX’s share price. At the same time, any one company cannot have a weighting of more than 10% to trade on the DAX. Companies trading on the German DAX are reviewed quarterly – they are added or removed based on the size of their order book and their market cap. The prices used to formulate the DAX index are calculated by the second through trading platform Xetra. This makes the index a very liquid market - another reason why traders like to trade DAX. Advanced AI technology at its core: A Facebook-like news feed provides users with personalised and unique content depending on their preferences. If a trader makes decisions based on biases, the innovative SmartFeed offers a range of materials to put him back on the right track. The neural network analyses in-app behaviour and recommends videos and articles to help polish your investment strategy. This hopefully helps you refine your approach when you trade DAX. Trading on margin: Providing trading on margin (20:1 for major indices), Capital.com gives you access to the DAX 30 index with the help of CFDs. Trading the difference: By trading CFDs on the DAX 30 index, you don’t buy the underlying asset itself, meaning you are not tied to it. You only speculate on the rise or fall of its share price. CFD trading is no different from traditional trading in terms of its associated strategies. A CFD investor can go short or long, set stop and limit losses and apply trading scenarios that align with his or her objectives. So whether your view is positive or negative, you can trade DAX in both directions. Focus on safety: Captal.com puts a special emphasis on safety. Licensed by CySEC, it complies with all regulations and ensures that its clients’ data security comes first. The company allows to withdraw money 24/7 and keeps traders’ funds across segregated bank accounts. If you trade DAX, you will notice that the listed companies are manufacturing-heavy. The DAX 30 is mostly comprised of automobile and chemicals manufacturers, like BMW and BASF. The Big Three automobile manufacturers – Daimler (parent company of Mercedes-Benz), BMW and Volkswagen – hold a significant portion of the DAX’s weighting. The DAX index was first published on the Frankfurt Stock Exchange on 1 July 1988 with a starting index level of 1,163 points. Frank Mella, who was then editor at German newspaper Börsen-Zeitung, is credited with the DAX’s invention, after his publisher gave him the task of devising a German stock market index. The operator of the DAX 30, Deutsche Börse, has added several related indices since 1988. These include the MDAX, which represents the 50 biggest companies after the DAX; the TecDAX, which represents the 30 biggest technology companies outside the DAX; and the HDAX, which combines the DAX, MDAX and TecDAX. The DAX share price often tends to be considerably volatile in comparison to its UK and US counterparts, making DAX trading an attractive opportunity for traders. As with any trading, however, it is not without its risk. What is the Germany 30? Germany 30 is a term used by Capital.com, along with most other leveraged trading provides, for our market on the DAX. 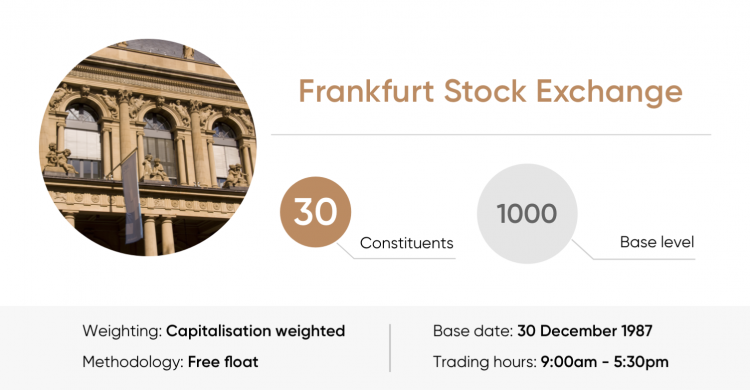 Germany’s indices are taken from the ‘Prime Standard’ portion of stocks on the Frankfurt Stock Exchange, which has strict regulations in place that govern transparency and imposed by German law. Any company listed on the DAX that fails to fulfil its Prime Standard requirements will be demoted to ‘General Standard’, and is thus unable to feature on the DAX, MDAX, TecDAX or HDAX.